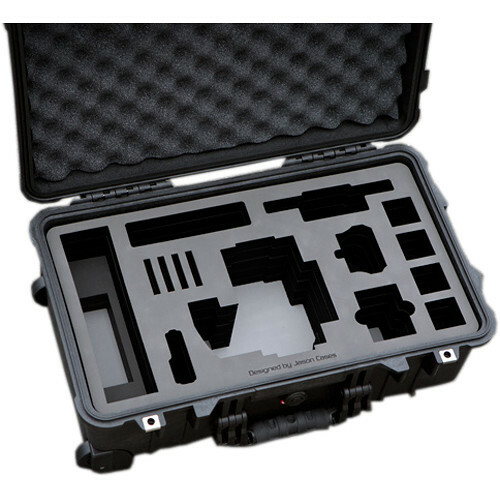 The Hard Travel Case for RED EPIC/SCARLET from Jason Cases is a Pelican 1510 unbreakable, watertight, airtight, dustproof, chemical-resistant, and corrosion-proof hard case. The inside features a laser-cut high-grade foam insert to protect the equipment and keep it in place. It holds a RED EPIC, SCARLET, or DRAGON camera body with lens mount, side handle, 7" Touch LCD, BOMB EVF, REDMOTE, four RED MINI-MAG cards, four REDVOLTS/travel chargers, and a RED AC power adapter or REDMAG reader. An extra slot is provided for cables and accessories. This case is airline carry-on approved. Box Dimensions (LxWxH) 22.4 x 14.0 x 9.3"